Classic ring boxes are elegant. The engagement ring jewelry box used to present this precious symbol of love and commitment is nearly as important as the ring itself. Fortunately, there are many types of boxes to choose from that will properly showcase the ring in all its glittering splendor. 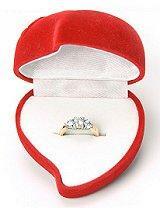 Before proposing, many soon to be engaged individuals wonder whether using the engagement ring box is even necessary. While it is true that a proposal without the ring box can be more elegant and discreet, it can also be more dangerous. The ring box is not just a pretty gift box, it is also designed to protect the ring from damage, scratches, or loss. If, however, the ring can be kept safe and secure, the box may not be necessary for the actual proposal, though it should be given to the bride-to-be once she has accepted the commitment so she can properly store the ring. A variety of geometric shapes, such as squares, rectangles, octagons, and ovals. Choosing a box that matches the diamond shape of the engagement ring creates an elegant and coordinated parallel. Arched or flat lids that may or may not be lined with velvet or silk. Novelty engagement ring jewelry box shapes, such as hearts, domes, crowns, treasure chests, or roses that may be used as keepsakes or even substituted for a wedding ring pillow during the upcoming nuptials. Elaborately detailed boxes encrusted with beads, crystals, shells, or embroidery, or embellished with mirrors, tassels, and other intricate accents. Different materials, such as wood, velvet, silk, leather, glass, or china boxes. Customized boxes with initials, dates, or other sentiments engraved or carved into the box itself. Music boxes that add a romantic element to the box. Different colors including white, ivory, red, blue, brown, green, or other hues. Double ring designs to hold a bridal set or the matching wedding ring. With many different ring box designs to choose from, it is essential to remember that the box itself is not the most important token: the ring is. The box should display the ring proudly and elegantly without overshadowing it. In some cases, an elaborate box may have additional meaning, however, such as a Celtic box that matches a Celtic engagement ring and may have family or cultural significance. 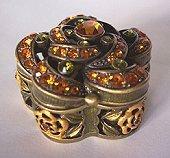 Jewelry Box Direct: Intricately detailed boxes with gems, flowers, and other romantic details. The Ring Box Company: Personalized wooden ring boxes. 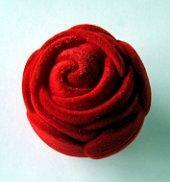 JewelryBoxes.com: Wide selection of jewelry boxes for different types of jewelry. After the "yes," it is important to store the engagement ring properly so it looks its best at the wedding. 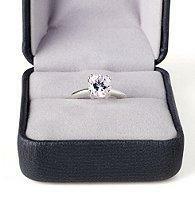 Ideally, the engagement ring should be kept in its box whenever it is not worn so it is not damaged or lost. Do not store an engagement ring in a jumble of jewelry - the diamond could scratch other gems and metals, and the engagement ring's band could be nicked or scratched as well. If the box is too bulky for regular storage, choose a larger jewelry box that has a ring compartment with velvet or foam ridges to hold rings securely and safely. An engagement ring jewelry box is an important tool for keeping a ring safe and secure, but it can also be a beautiful case for displaying a treasured ring. Whether the ring is stored in a classic velvet box or an elaborately detailed trinket box, it is sure to be highlighted as the wonderful icon it is.